Are You Now or Have You Ever Been: Where Are You Listed Online? 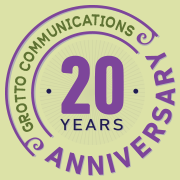 | Grotto Communications Inc. Ever wonder if you are on some kind of list? How did you get there? What are people saying about you? Seems like the expansive frontiers of the internet would make it easier to track that sort of thing. And in some ways, it does. The unsung workhorses of your marketing mix are those directory listings in all the nooks and crannies online and in print. Make sure you keep an eye on where and how your company is showing up. A typo in a web link or outdated contact information in a resource guide could mean you’re missing sales opportunities. Google yourself. Google your company. Do it every few months and make a quick list of where you are showing up. Try a couple of other search engines (Bing, Yahoo, MSN). Ask colleagues to do it, too, so you can compare results. Do an inbound link check and scan your web site traffic reports to see where visitors are coming from. We discovered one client was getting some traffic from their local library. Turns out, the library lists health, education and not-for-profit organizations for free on its web site. Take advantage of these places to get the word — and links — out about your business. My company is a member of the Evanston Chamber of Commerce which upgraded their membership management system not long ago. A recent email reminded us to log in and check out the new features, including expanded descriptions and other SEO friendly items. How many people do you think have taken advantage of this opportunity? According to the chamber office, less than 20% of members did so in the first three months. Even if that listing adds just one more spot where you can add a Facebook page link, put up a photo of your storefront or describe of your services, those few minutes of attention you spend with it lets you fine-tune your brand and build your network. More, more, more. Really, as long as the web site is reputable, just keep finding ways to expand your presence online. Keep a list of links and the date when you last checked each in an Excel worksheet. Even if you spend less than an hour per quarter poking around and updating info here and there, the improvements will help. Put it on your schedule so that you can check back once in a while. This regular review step is becoming more critical as Yelp and other services offer your clients a platform upon which to spout. More on handling those in a different post. Stay tuned!